We hope everyone has been enjoying fall, we have had a busy foliage season and have enjoyed unseasonably warm temperatures, sunny days, and great color of course! Recently we hosted a meeting of the Wilmington Historical Society. They were excited to see the Inn as many of these folks have memories of playing with past owner’s children in the Inn during the 50’s and 60’s. After sitting in on this meeting, listening and contributing what we know about the history of the Inn, we thought what a great idea for a blog post! 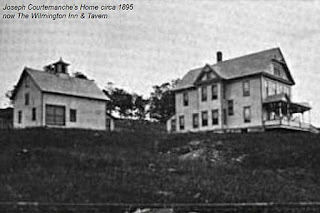 In this post, we will enlighten you with some brief history of the Inn as a building but mostly about the original family. 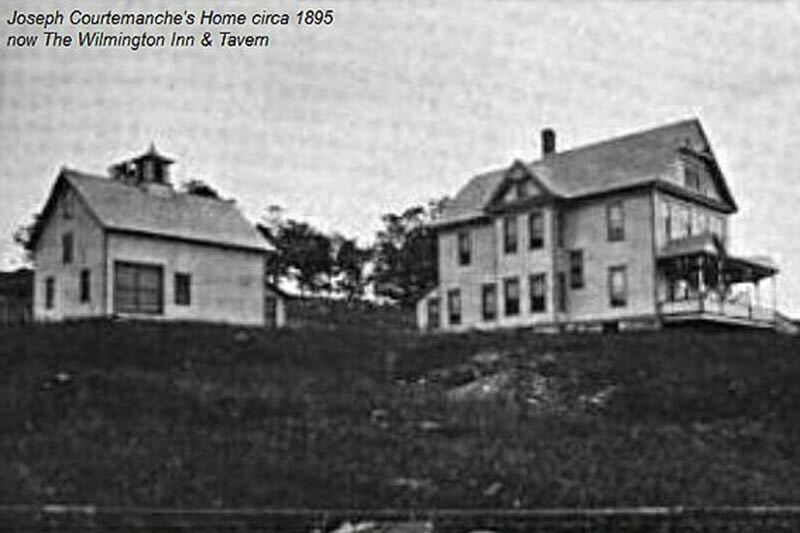 The Inn was built in 1894 by Joseph Courtemanche (this is where our suite with this name comes from!) Joseph Courtemanche came to Wilmington from Quebec in 1873 when he was 20 years old. His first occupation in Wilmington was a blacksmith. In 1875 he married a local girl named Jennie Wheeler, they had 4 children. The Carriage House was built in 1876, the main house would follow and be built 18 years later. The carriage house, when built served as his workshop with a woodshop on the 1st floor and a paint shop on the second. This enabled Joseph not only to do all needed repairs both wood and iron, but he developed a successful business manufacturing sleds, carriages, dump carts, etc. Fast forward to the Inn Years, the carriage house was converted to 4 additional guest rooms (to accompany the main house) in 1989. In 1894 in addition to being the year the Main house was built, Joseph Courtemanche answered pleas from town’s people and took the responsibility of installing an electric light plant for the village. 36 incandescent lights were put in town, as well as some lights in local residences. Lights stayed on only until 11pm unless something very special was happening in town. The Courtemanche’s ran the plant until 1930 when New England Power Co bought it. The property was a private residence until becoming the Gavit Lodge in 1956; during this time the ski industry was starting to boom with the invention of the ski lift. The next owner changed the name to the Red Shutter Inn which remained the name till 2006 when the name was then changed to the Wilmington Inn & Tavern. The Inn is currently called the Wilmington Inn after the tavern was closed in 2013. In 2011 Hurricane Irene hit Wilmington, but the Inns’ location up on the hill saved it from any devastation. The State of Vermont & more specifically Wilmington got hit with severe flooding causing 6-10 feet of water to flood downtown Wilmington & other parts of Vermont. Vermont residents came together & rebuilt the state one road and building at a time. We have so enjoyed meeting many locals and past owners who have shared a lot of history and stories with us about “the old days” and what they remember. We love that we have started a new chapter for the Inn while continuing to grow it and make improvements all while keeping the history intact. We hope to see you soon if you haven’t made it to meet us in person and see all we have done so far! If you are one of the many people we have had the privilege of welcoming to the Inn we can’t wait to welcome you back.